Adv. 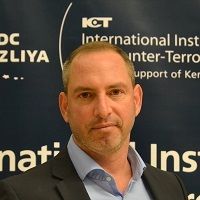 Yariv Sagiv is an Associate at the International Institute for Counter-Terrorism (ICT) at The Herzelia Interdisciplinary Center (IDC), Israel. Adv. Sagiv is the founder and Executive Director of The Yariv Sagiv & Co. Law Offices, Established on 2003. Adv. Sagiv held a variety of positions within the Israeli Security Forces for over 12 years. Adv. Sagiv served as a Director of The Natural Gas Authority Council of The Ministry of National Infrastructures, Energy and Water Resources (2011-2014). Adv. Sagiv is a graduate of The Herzelia Interdisciplinary Center Faculty of Law (2000). He holds a Master's degree in law from the University of Bar Ilan (2003).